This well designed book is subtitled, ‘The introductory guide to success in baking Real Bread for your local community’. How well does it fulfill its remit? How far along the line from interested or amateur baker to community purveyor of Real Bread can ‘Knead to Know’ take you? My view is shaped by my particular needs. As regular readers of the blog and my twitter feed will know, I’m a keen amateur baker. And I’ve had enough good feedback about my bread to wonder about producing bread for the wider community. So here were the questions I was hoping ‘Knead to Know’ might help me answer. How would I go about setting up such a venture? what’s involved in scaling up domestic recipes? would I manage using a domestic oven? What are the rules & regulations I’d have to be aware of? Were there tips and ideas for promoting the venture? What product mix would be good to start with? How would I work out product pricing and ingredient yield. Where would I go for further information? So how well did it do? The first striking thing about ‘Knead to Know’ is the excellent design. Inside the full colour cover is a two-colour, two column layout. The typography is clear and unfussy. The second colour is used well for headings and sub-heads and quotations from ‘real’ community bakers (of which more later). Graphics, including photographs, are used well to support the feel of the project. Other design features such as the use of illustrative tables and bulleted lists are well used. So in design terms ‘Knead to Know’ is easy to read and understand. What of the content? There’s a handy sampler of the book on the campaign website, so Iif you’d like to know what’s in it section by section, download that. The content is thoughtful, inspiring, packed with relevant experience & insight. Above all, it’s steeped with practicality. The ‘technical’ bread baking elements are treated well. There is useful information about all aspects of the process. However, if you’re looking for a detailed text book on non-domestic baking, this book is not deisgned for you. As part of my eclectic career (I think that’s what it’s called), I’ve a Law Degree and a Masters in Business Administration. So I was particluarly interested to see how the legal and business aspects were treated. I’m really impressed. Within its limited remit, ‘Knead to Know’ does a superb job at highlighting and explaining the relevant aspects. If you wanted to go further, the additional resources would be a big help. I thought that the ideas for market research and promotion including media relations were both practial and showed good imagination. The hands on experience of the real bakers in these areas was especially good. The text is liberally (and appropriately) puctuated with links for online resources to find out more. These are usefully supplemented at the end with more links and reference resources. Especially useful is the link to a Food Cooperative Toolkit. I found that the book stimulated plenty of ideas as to how I might go about setting up such a venture. In particular, it stimulated ideas about which people and organisations would be good partners to ensure success. Whilst I don’t have complete answers to all my questions, I do have a good idea about where to go next. So I’d say this is job well done. 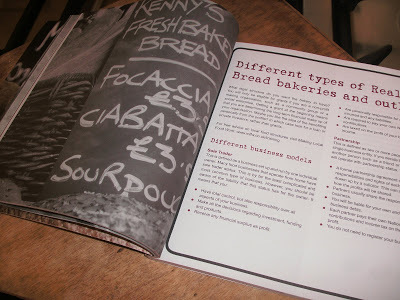 If your curious about whether community baking is for you, I recommend you buy ‘Knead to Know’. Yo Carl, go go. Am quite excited about your community baker project. So wish someone would start one here. Although, now I'm baking my own bread again, I'm not sure they'd get much out of me. Hi Carl, Am mightily relieved to read that you enjoyed the book and recommend it. Just cut into your latest freshly made loaf, and as ever, it's just wonderful. I am the luckiest member of our community so far – the people of Llyn deserve to eat this bread!